One of the most eye-opening stories I'd come across while researching the history of the neighbourhood was the tale of the huge brick farmhouse which existed for many years on Richmond Road, but was moved somewhere else, at some point in time. This is what I had to go on for several years, and in chatting with other local history buffs, others had perhaps heard the story too, but no one could confirm what house it was, or if the story was even true. In the summer of 2013, the Kitchissippi Times ran a contest to "win the history of your house" (done by yours truly of course). The winning entry was particularly intriguing to me - a woman on Patricia Avenue lived in an old home that she believed may have been moved. She and her husband were once told by a contractor their foundation was much newer than the house which stood upon it. That was all she knew, but had no guess as to the story behind it. What a great coincidence for me! Sure enough, through researching the amazing history of the home, the connection was made. 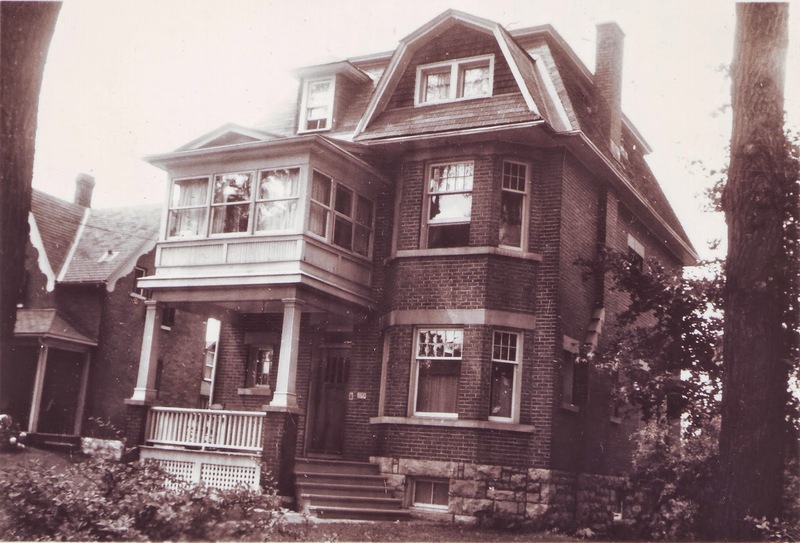 Indeed her home which now stands at 333 Patricia Avenue (just north off Richmond Road) had stood for over forty years 130 yards to the south, on Richmond Road. 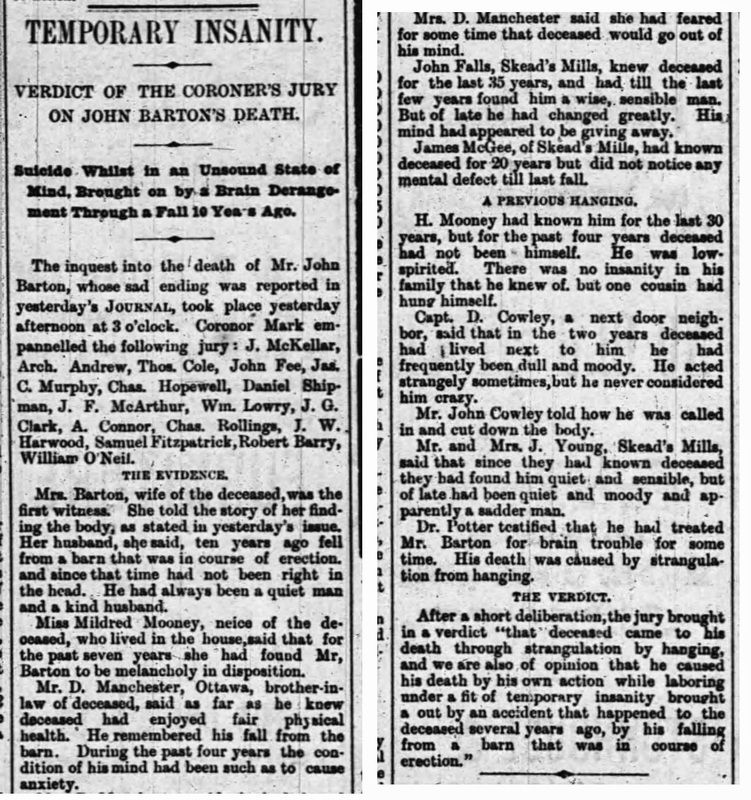 The summary of this incredible story was published as the cover story for the Kitchissippi Times in September of 2013 (you can view the article here: http://kitchissippi.com/three-stories-of-stories/). But with the freedom of this blog, I'd like to share this story once again, with a bit more detail. The story begins in 1890, when a long-time Goulbourn farmer John Barton purchased the vacant 6-acre property at the north-west corner of Patricia and Richmond (the former Canadian Tire site, now a condo building), and built a farmhouse. 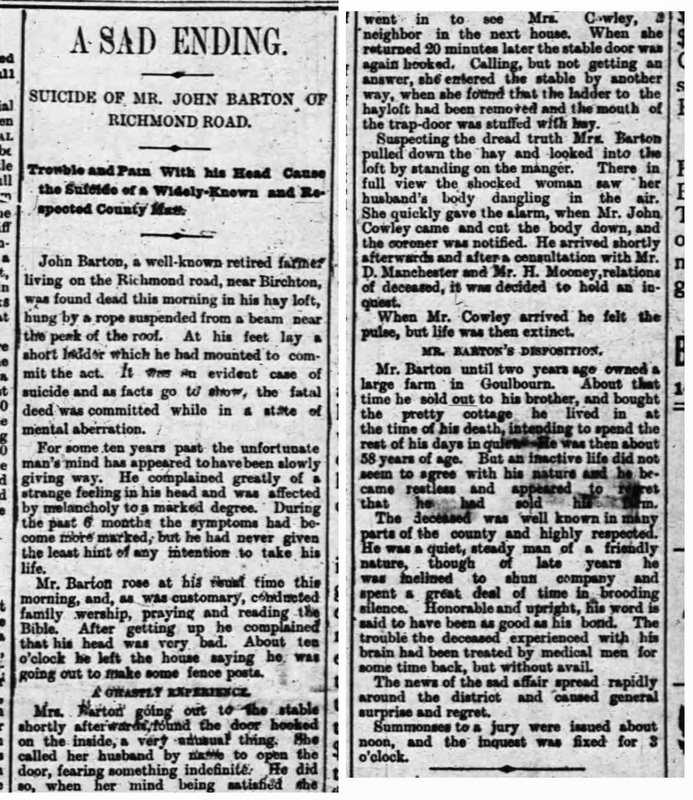 Barton was much loved in the village of "Pleasant Valley", and his departure was a blow to his friends (see the newspaper account published about his farewell party). In November of 1890, John and his wife Mary Ann moved in to their newly built house. The widowed Mary Ann Barton remarried in 1895, to a widower Thomas Hand, who was loosely related to Mary Ann through marriage (Thomas Hand’s daughter Sarah Jane had married Alfred James Barton, the son of John Barton's brother Benjamin). Thomas Hand was an elected Councillor of Nepean Township council, first serving for the 1895 year. He likely found the move to Richmond Road quite an advantage, as it was just a short walk from Nepean Township hall at Richmond Road and Churchill. In September of 1912, the youngest son to Thomas Hand, Selwyn Hand, was married to Stella Pedley, and as a wedding gift, received an 11,000 square foot portion of the Barton-Hand property on Richmond Road. Construction began immediately on a new home next door to the original Barton farmhouse, and was mostly finished by early 1913. 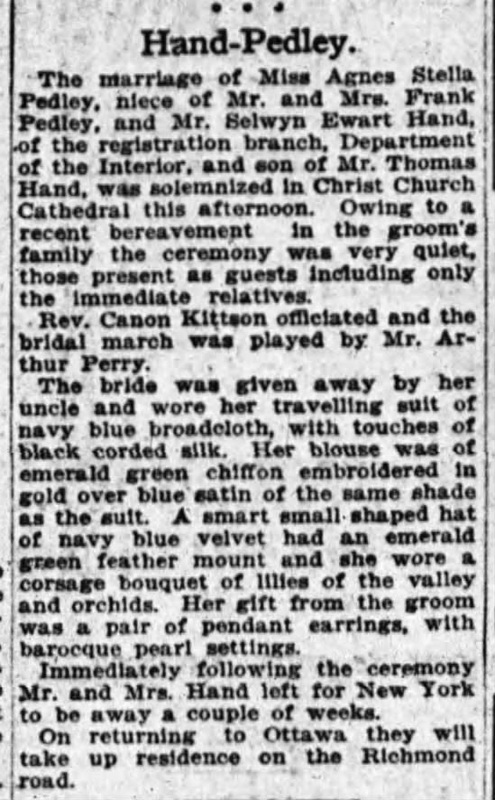 The report of the Hand-Pedley wedding can be seen at right as a fine example of the way Ottawa newspapers once reported on the happenings of its citizens, back when Ottawa was still a relatively "small town" and the newspapers still heavily focused on local news. On April 21st, 1913, the Nepean Township assessor visited the property and assessed it with a value of $1,200 for the house (and $200 for the land), and noted that it was occupied by 2 persons. 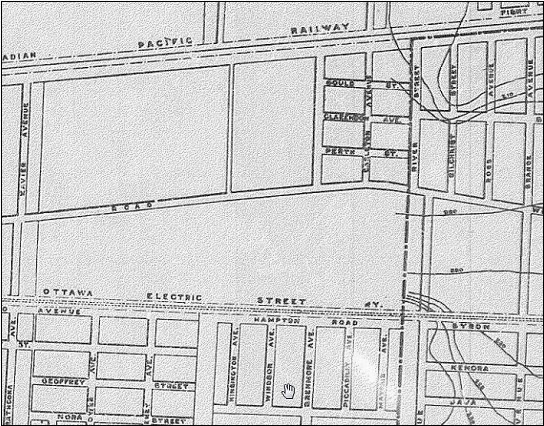 Patricia Avenue at the time did not really even exist. It was merely a small lane (known unofficially as Potter's Lane) running north towards the CP Railway line, and was more of an access lane to the Riverside Park (now known as Champlain Park) community. Of course Island Park Drive was still 10 years away from existing as well. The Hand family grew, and raised their family in this home over the next 41 years. 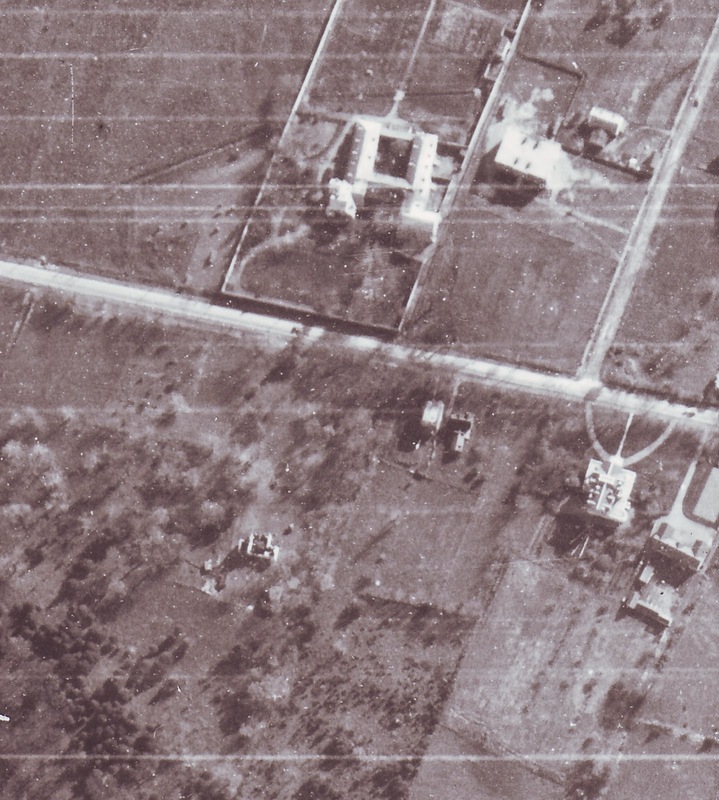 A shot of the house can be seen in the 1920 aerial photograph below. Richmond Road cuts through left to right. The convent can be seen at the top, Hilson PS is to the right of it, and that is Hilson Avenue running south towards the top off Richmond Road. The Hand houses can be seen in the center, below Richmond Road (Selwyn's house on the left, the Barton farmhouse on the right). The impressive Heney property is at right, and otherwise, it's a vast open area, a few years before Island Park would be cut through. And here are the two houses as they stood in the 1940s fronting on Richmond Road. The Selwyn Hand house was #119 Richmond Road, and the old Barton house (seen in the background) was #123. The year 1953 was a year of great change for the Hand family, and the home at 119 Richmond Road. Selwyn Hand had become ill, and since his children had already grown up and moved out, made the decision to sell the home before his illness worsened. On May 1st, 1953, Selwyn sold the entire property to Neil Malcolm MacNish for $40,000. MacNish was the owner of Ottawa's only Canadian Tire location at the time (at the corner of Kent Street and Laurier Avenue), and endeavoured to open a second Canadian Tire for Ottawa on Richmond Road. 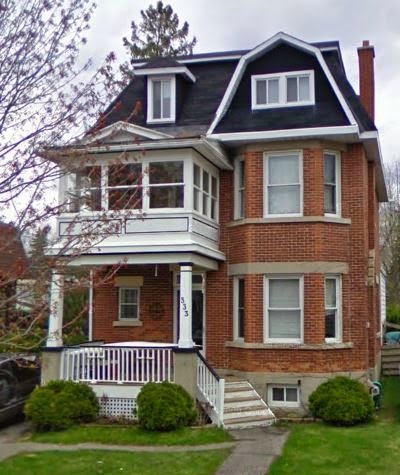 Though MacNish would have the Barton farmhouse demolished a few years later (it actually continued to stand next to the completed Canadian Tire for several years) to make way for the parking lot and future addition, he found a buyer for the Selwyn Hand-built home at 119 Richmond. Jean R. Woods, who resided at 329 Patricia and owned the vacant lot on both sides of his house, must have preferred the idea of moving the Hand house, rather than having to build something new on his vacant lots. He purchased the house at 119 Richmond Road from MacNish for $2,000, and right away set about making arrangements to have the home moved. Jean Woods immediately hired contractors to begin the daunting task of preparing not only the house for its move, but also the vacant lot further down Patricia. The F.E. Cummings Construction Ltd. (owned by Frederick Ernest Cummings), located at 388 Richmond Road was hired as the primary contractors for the move of the house, the construction of the new foundation, and other finishing jobs on the new location. Earle Electric (owned by Eber Earle, located at 1394 Randall Avenue) was hired to do the electrical work at the new location. And well-known local plumber and home contractor Wilfred J. Carriere (of 18 Western Avenue) was hired to do the plumbing and heating work. Frederick Cummings' son Garry was a teenager in the 1950s, and was present when the house was moved from its spot on Richmond Road, down Patricia Avenue to lot 69. In January of 2014, I asked him about his recollections of the move. "The move took place over days. About a week. It was a big job, a three-storey house. Rollers were used. The house was placed on jacked up wood block piers and put under timbers, onto wood rollers. The house was moved out to Patricia, down the street, and then we had to turn it, then move it on to the foundation." I asked him if his Dad's company had done the new foundation and he replied "I assume so." He added "I can't recall exactly how we made it move, power-wise. Dad's company did a lot of moving in Manor Park at that time years ago, and used a pulley with a horse that was tied to ropes and walked around a pole in a circle." Further, he added "to move down Patricia, it had to be accurate. With a grade going down, it was important to keep the house level the whole time moving it." Garry remembered that the foreman on the job was Adelore Laderoute, who worked with his son Eugene. "They were the two main men on the job. Adelore was the (company's) main moving guy, the superintendent of house moving." Garry doubted there were any photographs available of the house move, or at least he was unaware of any. I asked him if there was anything special he recalled about the move and he said "It was just a regular move. Nothing spectacular." Sadly, just days after selling his home, Selwyn Hand passed away on June 17th, 1953, at the age of 70. As for the Woods family, once the newly-moved home was ready at 333 Patricia, they moved in. Sadly for them however, the costs of the move proved to be too much, and after a series of extra mortgages and liens by the contractors, they had no choice but to sell the house in July of 1954. However, we have Jean R. Woods to thank for this great story, and his incredible idea to move (and thankfully preserve) this awesome heritage-worthy house, which still exists today at 333 Patricia Avenue. My brother sent me a link to this article on your blog as he thought I might be interested in reading it. I knew the family who bought the house in the 1960's, the Assad family. I spent a lot of time at the house as I was a friend of the son Sandy (John), who I met when he attended St. George's school I believe around 1966. John still lives in Ottawa in the Alta Vista area and is a real estate agent.